I am a fortunate man to have had a positive role model for cycling in my life... my dad. I grew up in a small town in Michigan (Alma, if you're familiar with central Michigan) and my dad was one of the few (possibly the only, in car-happy Alma) who rode his bike to work. He did it with his suit on and though he didn't try to tough it out in the winter or inclement weather, when the weather was nice he was on his bike. The rumor was that people would see him reading the paper on his bike on the way to work, but he always strongly denied it. When he hit the curb one time and broke his wrist, the rumor was even more widespread. 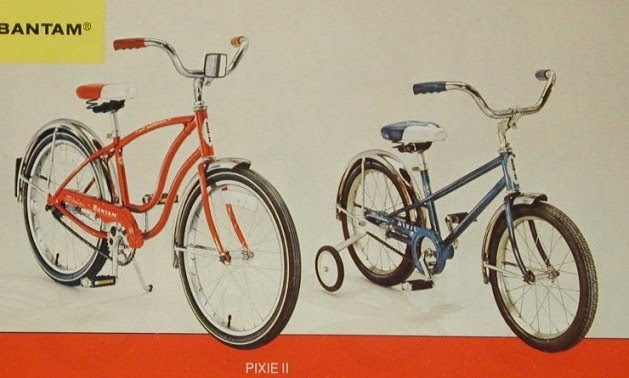 My first bike was a red Schwinn Bantam (mine didn't have big green streamers on it, though). I got it for Christmas one year and I loved it from the beginning. I wasn't able to ride it to school because our elementary school didn't have bike racks as far as I can remember. It didn't really matter, anyway, because I walked to school, so I was still getting exercise and not wasting gas. The other big thing I remember about that bike was that if you re-arranged the letters in the name, you got "Batman." And I thought that was pretty cool. It was just the thing for riding around the neighborhood, and of course I didn't have any silly banana seat - my bike was a classy item! 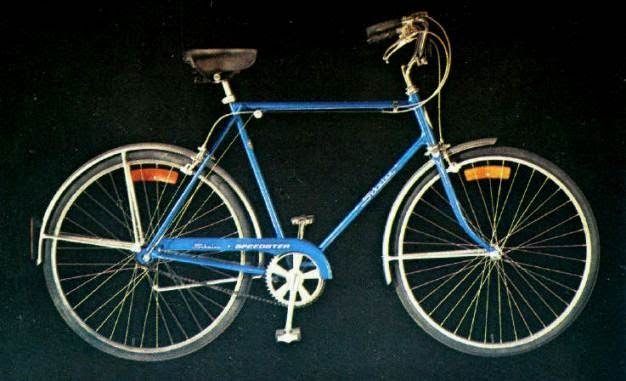 My next bike was also a Schwinn, a Schwinn Speedster. No hand brakes or multiple speeds or anything like that... just a regular coaster. I rode that bike to school pretty regularly. My middle school had a bunch of bike racks in front of it, so that was nice. 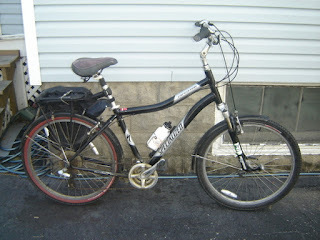 It was sturdy, got me around town with no problems, and I rode it a long time... until my first boy scout bike-campout. Most of my friends on the campout had ten-speeds (or at least five- or three-speeds) and they were able to adjust to terrain and wind and the like. I, on the other hand, was stuck in the one gear I had. So I was getting wiped out while everyone around me was having an easy time of things. I continued to ride that bike for a while, but eventually I gave it up for a used ten-speed. The local bike shop fixed it up for me with new gear shifts, brakes, etc. and I was good to go. I rode that bike through high school in the spring and fall months, and throughout the summer. In the winter, I drove or got a ride... especially on those mornings when swim practice before school was a requirement. But even then, I wasn't too taken with cars. They were big and smelly, required too much maintenance and money for gas, and I have just never been big on driving. In college, a bike wouldn't really have helped much. Notre Dame is a walking campus - nothing's more than about a ten-minute walk away, so a bike wasn't really necessary (in fact, folks who tried to ride their bikes on the sidewalk were pretty much hated as there just wasn't enough room). And there was good public transportation everywhere off-campus if you needed to go there, plus dad let my brother and I share a car while we were there. I never really even thought about having a bike immediately after college - I rode one to my summer jobs while in college pretty frequently, but I wasn't comfortable on the main road in Alma with all the car maniacs. But my one summer job was an eye-opener for me. I was working in a convenience store and one of my co-workers was a girl named Kris, who was about 4 years younger than me. And we'd be chatting during the lulls in waiting on people, and I noticed that whenever she asked me if I knew someone and she had to describe them, she told me what car they drove. I have NEVER identified a person by their car - I knew what cars my friends had and that was about it. And I asked her about that... actually, I think what I said was "why are you telling me what car they drive? No one notices that!" Well, apparently I was wrong. She couldn't believe I DIDN'T pay attention to what cars people drove. But then, I drove my $2000 1987 Mercury Lynx wagon, which was simple basic transportation. I didn't care what car I drove. And I frequently got asked when I was getting a new car... I quickly learned that cars were, for whatever reason, something that identified you. But that didn't change me. I only got rid of that car because it was falling apart... after putting 31,000 miles on it. 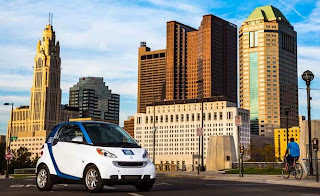 When I moved down to Columbus I was driving all the time. As a consultant I really couldn't help it. I was rarely in one position for a year at a time... and I was consulting for about 7-8 years. Eventually I started taking the bus when I was in one place for a while... that was nice because I didn't have to sit in traffic, I could read on the bus, or whatever. When I started at Ohio State full time, I continued to take the bus. 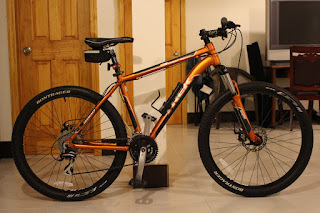 I actually did own one other bike during this time - my wife used some rewards points that she got from incentive deals from her sales job to get me a mountain bike - a beautiful Trek 3900 bike (though mine was orange). 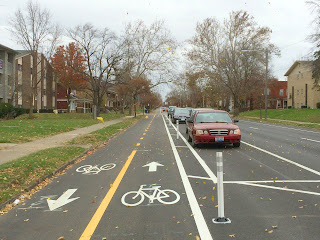 I rode it a bit, but for whatever reason it never occurred to me to try to ride to work (though I did ride it around town on errands and to Columbus Crew games occasionally). And eventually that bike got stolen, before I was able to get out and ride some trails on it. But I started to think about riding to work not long after my Trek was stolen. And last year I got a bike for my birthday... so now I have my Specialized Expedition Sport. And I have two locks for it, one cable and one u-lock. I've added Fenders, lights, the whole nine yards. This is my commuting baby right now. I'm still looking for a rear rack and panniers for it, but I have never been happier about commuting to work. I'd still sort of like to have a mountain bike, too, but it'd only be for fun... and I have to say I've never been happier with a vehicle than with the one I have now. So... what kind of bikes have you had and loved? Tell us about them in the comments! Six or seven years ago I bought a Steelman cross bike. I didn't actually plan to race cross, but it seemed like a really versatile bike that would get a lot of use. I rode it on dirt, road and some fairly technical trails a couple of times. Currently, it's sporting a set of Armadillo Skins, fenders, front rack, and a rear rack that also supports a baby seat. I take my daughter for rides, get groceries and commute on this thing. The quality and material used make for one comfortable ride. 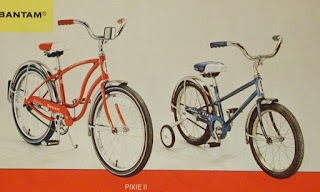 The other stand-out in my past was the red coaster-brake single speed with white saddle/grips/pedals I got when I turned six. 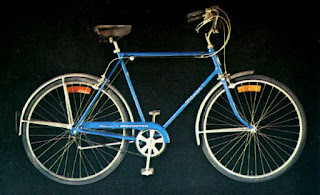 I can't recall the brand or what happened to it, but I still recall that bike being my first real one. I really like my bike. i have an old cannondale 300. I got it from a bike cooperative for $100. It has a lightweight aluminum frame and instead of big knobby tires, I have smoother tires-though not the fast skinny ones. I'm starting to learn more about bike repair from going to workshops, so I thinking that I'm going to put new pedals and maybe even a crank set-it's fun to contemplate!